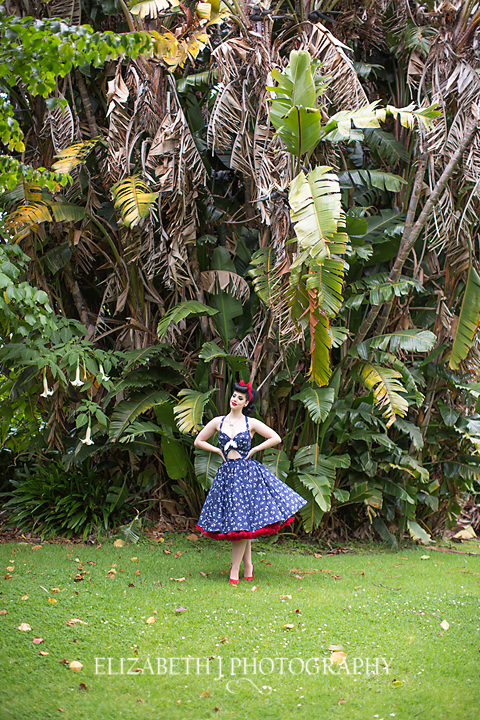 The Pinup Girl Clothing Renee Dress was one of the goodies I managed to snag in their infamous Black Friday Sales! It was a tense 2 hours before my order finally processed but it was worth the wait to be able to get some items I had been eyeing up for 30% off. The Renee had been one that I wasn’t 100% sure of until I was able to try one on at Rita Sue Clothing. They only had one and it was a size too big but it helped me get an idea for how it fitted and how big the cut-out was. I had initially been waiting for the solid red version that had been previewed months ago but the anchor print slowly grew on me. Since I already had a couple of solid red dresses and with no indication if it was still going to come out, I decided to go with the Anchor Print! The size I tried on at Rita Sue Clothing was a medium and it was much too big in the waist and still had room in the bust so I knew to order the small. For reference my bust measures 36″ and waist measures 27″. The small fits much better but I couldn’t be any bigger in the bust. Luckily the top of the back is elasticised which makes it comfortable and easier to zip up. When it arrived, I was pleasantly surprised by the fabric- I had expected the thin cotton of the anchor print Netti Dress which I used to have but this fabric is thicker and feels much more high quality. 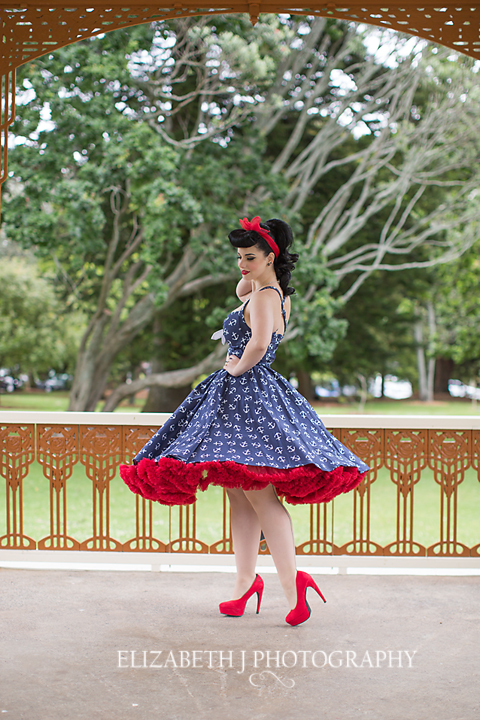 Pinup Girl Clothing is seriously upping their game time and time again when it comes to fit and quality. I’m never disappointed in a item and feel they are incredible value for money when you consider you could pay a similar price for a dress in a mainstream mall… except it would be cheap fabric, appalling fit and most likely made in China. The bust is really well constructed with light padding and a faux tie in the middle. 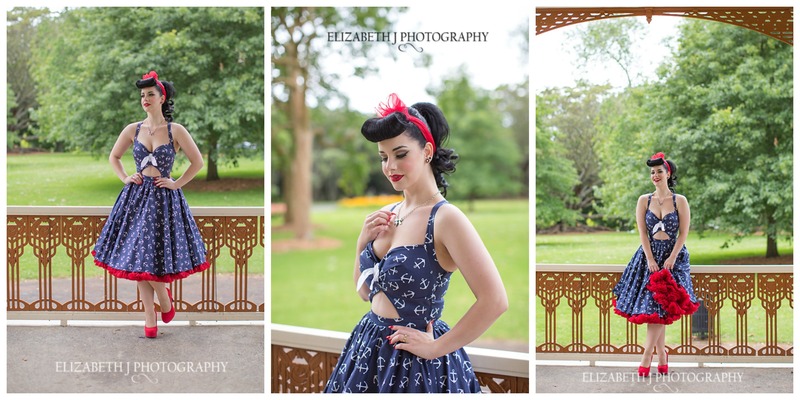 I need to start remembering that Pinup Girl Clothing actually DO make things that you can wear braless. It has just been such a unfathomable thing for my entire life that it’s quite a shock when I try something and it actually looks great sans bra and I feel adequately supported. I wore a strapless bra for this shoot but a few days later I tried it without… and I was amazing! The construction and padding of the bust keeps everything in place. I wish I’d tried it without a bra for these photos but oh well, at least now I know! The bust really makes the girls look amazing and perky. It’s a bit of a lower neckline than I’m used to and I haven’t yet decided if it’s one to wear to work yet… even though 90% of the time I’m wearing a apron anyway! This sort of thing wouldn’t work if the fabric and construction was flimsy but everything about this dress is top-notch quality. The waistband is reinforced and the lining in the torso area keeps everything in place. The straps on the Renee Dress are adjustable, something that seems to be a permanent feature on all of PUG’s strappy dresses- thank goodness! The skirt is full and a great standard length that hits below the knee (I’m 168cm). 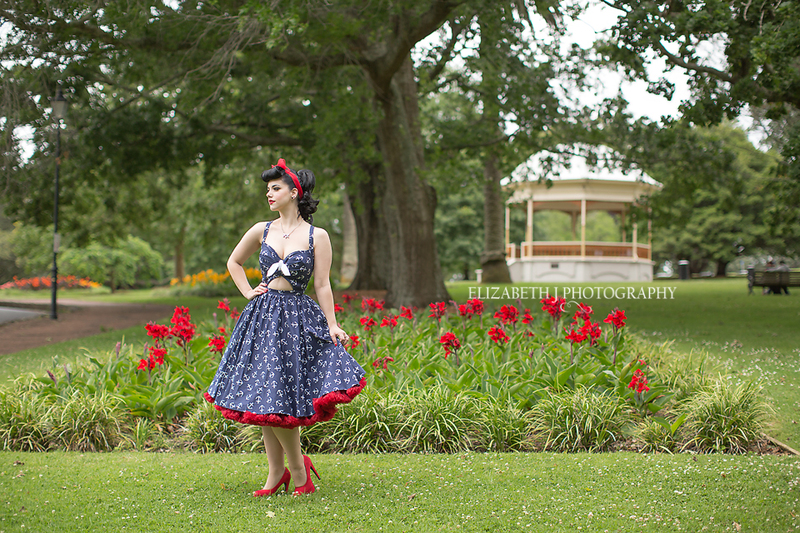 Elizabeth always manages to capture a perfect twirling shot! 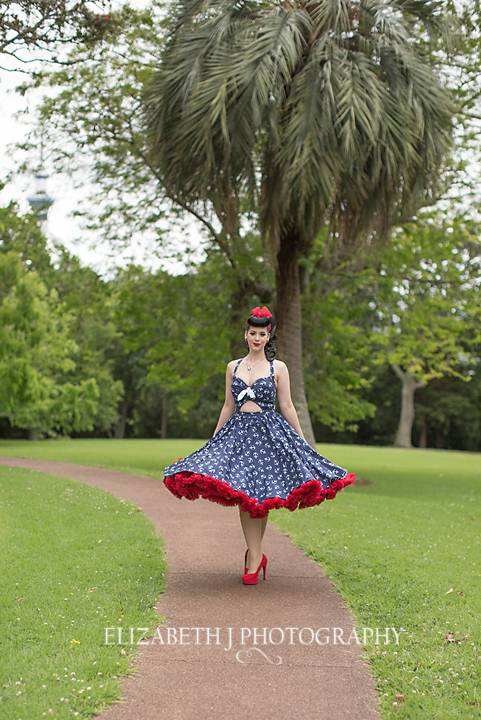 And the Renee sure does pass the MVV twirl test. The Renee also features pockets! 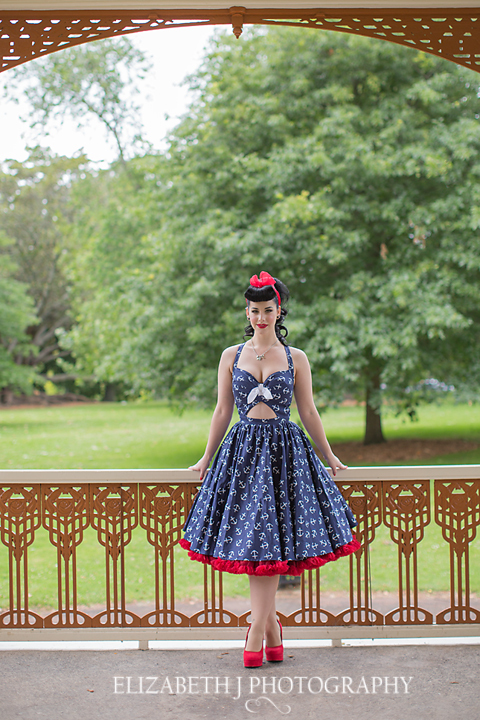 Pinup Girl Clothing have been putting pockets on a lot of their items recently and I love it! Especially since they are big, deep ones! 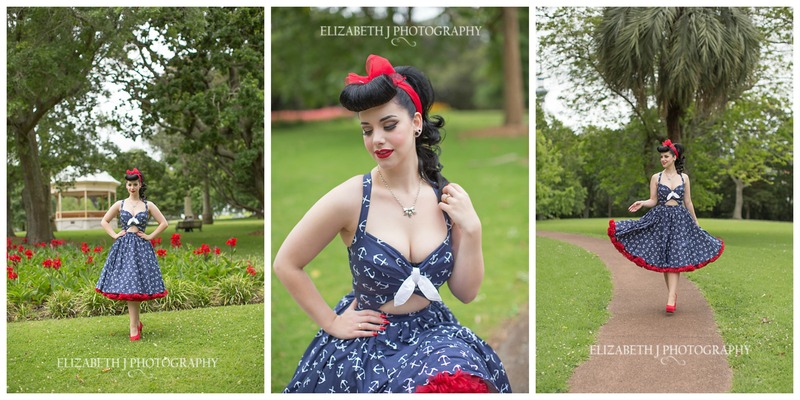 Retailing for US$130 with a size range of XS-2XL and also comes in two other fun prints to choose from- the Mint Pinup Girl Print and the Tipsy Elephant Print. Both these colourways don’t have a contrasting bow at the bust so if you are a bit worried about drawing too much attention to that area (although the cut-out will DEFINITELY do that!) then maybe try one of those ones. Because of the Renee’s cute nautical theme, I decided to use red accessories! I initially thought white, but the pops of red look so good! 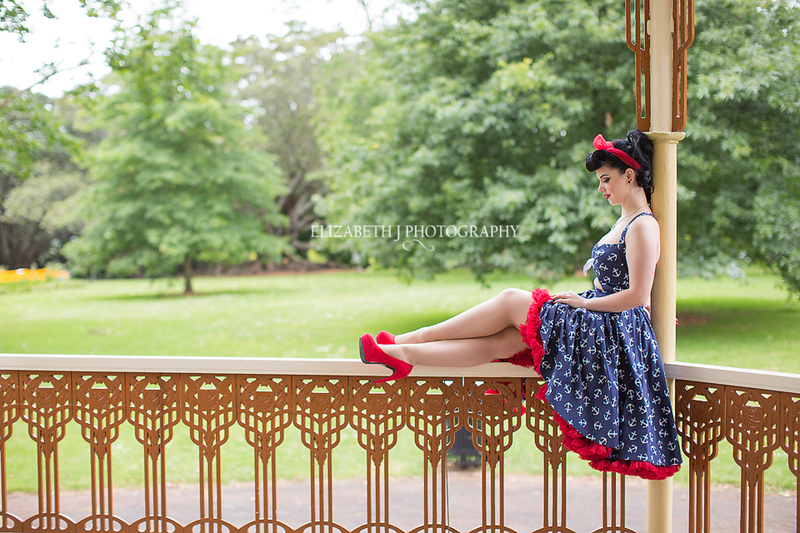 I’m wearing the red Vivien Of Holloway Petticoat, Novo Red Pumps, Rita Sue Clothing Headscarf and Femme Metale Necklace. 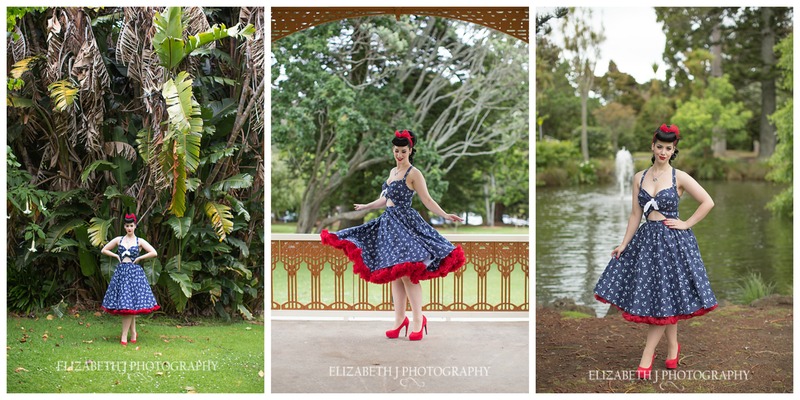 I love so many of the images Elizabeth J Photography captured from this shoot at the Auckland Domain. Liz never ceases to deliver and exceed expectations each time! Gorgeous! I wish I were young enough to wear a dress with a cutaway like that. You look fantastic. Normally I don’t care for petticoats showing beneath the hemline but this is one outfit that I think looks grand with this lovely petticoat showing! It adds so much to the whole look! I see the petticoat is from Vivian of Holloway. Do they make there own or are they available somewhere in Canada as well? Just out of curiosity, are you wearing the petticoat on your actual waistline? Wow, amazing! 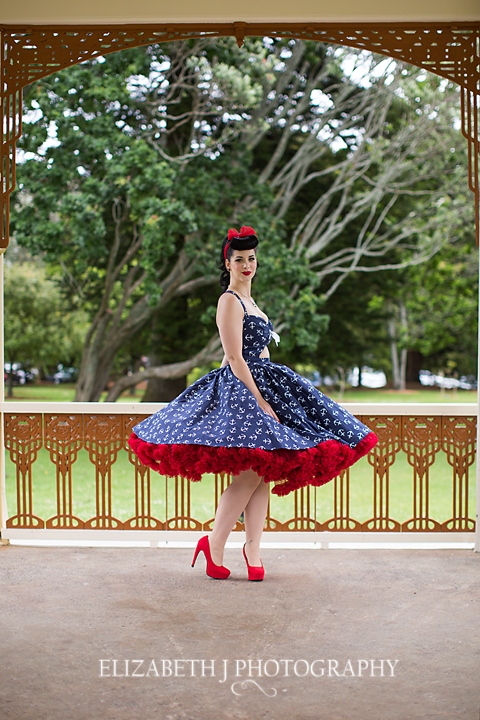 This isn’t a dress I’d wear, but it looks super on you, and especially with that petticoat!